Hello! My name is Facundo M. Carreiro and this is my first attempt in writing an article. I am currently starting my first year in the "UBA" university in Buenos Aires, Argentina, I'm going for the "Computer Science" MBA. I am currently developing a free Multiplayer Massive Online Role Playing Game in my free time, its fully in 3D using OpenGL and its portable to Windows and Linux. I'm learning a lot while I do it and I wish to share what possible with the community I learned from. I hope this article is helpful to you and I would really appreciate some feedback. To successfully read this article I suggest that you have a good knowledge of the C++ programming language, virtual and pure virtual inheritance, and the STL library. Knowing a bit about function pointers, unions and structs would also be great in order to fully understand the article. The code will be written in the C++ language with an Object-Oriented Architecture. I will not explain the different parts of the STL library but I will provide links to reference pages of the ones I will use (i.e. std::vector, std::list, std::string) so don't panic if you've never heard of them. Please read all the reference links that are between parenthesis if you don't fully understand a specific topic and always feel free to send me an e-mail if you have any doubts or wish to communicate something. Thank you. This article will explain how to create an abstract console interface that can be used in lots of contexts such as a "Quake Style" console or just a simple text-based console. We will focus on the inner operations and design of the console system so it will fit for many future purposes. We will create a console where you can input and output variables and execute commands. We will provide examples of where and how to use the system. We will NOT explain how to render a fancy-looking console. Key Input: The keys the user presses have to be passed to the console system so it con process them and add the characters to the command line buffer. Item List: This is the list of available commands and their associated functions, we also include here the list of variables and its type. Command Parser: After entering a command line we need something to analyze it and do what has to be done. This is the job of the Command Parser. Command Line Buffer: It is the actual command line being written by the user, after hitting "enter" it passes to the command line parser and most probably triggers a command. Output History Buffer: The text that the console outputs after executing a command or parsing a line is stored in an History Buffer of n lines. Command History Buffer: When you press enter to execute a command it is stored in the Command History Buffer so if you want you can see or re-execute previous commands easily. Rendering Output: There has to be some way to render the console data to the screen, should it be text or graphics. The data goes IN the class by using a function that receives the keys then, if needed, it calls the command parser who executes the command, changes the variable and saves the output in the buffers. The rendering function can be overloaded by the derived class and it has access to the text buffers so it can present the data in the screen. In the next section we will explain how to design the class in order to follow this design. When we write the base console class we are looking forward for it to be extensible because it isn't planned to be used alone but to be used as a base class to a more complex console class. I will explain this later when we get to the usage section (virtual functions info here). This two functions are the constructor and destructor of the class, in the constructor we initialize all the variables and the destructor is used to free all the lists and items. The destructor *HAS TO BE* virtual because we are going to use this as a base class and in order to properly call the derived class' destructor we make the base class' destructor virtual (more info here, and here). The "console_item_type_t" enumeration will identify the item, as you can see the item can be of different variable types or it can be a function. You can easily add more variable types by adding some names to the enumeration and just a few lines of code in other function, you'll see. The first two variables are straightfoward, but I can do some explaining about the union :). A union is used when you want more than one variable to share the same space of memory (more info here). The first item inside the union is a pointer, THE pointer to the variable when the item type is some variable type. The second variable is a function pointer (more info here), I will now explain it. Here we define the "console_function" type, this line of code means: "All the function command handles should be of type void and have a parameter where it will be passed the list of arguments for that command". Inside the union both the function pointer and the variable pointer are of type "void *" and only one will be used at the same time, that's why we can use a union to save some space in memory (we save one void pointer for each item in the list). We will now go back to the main console class, I hope you haven't lost yourself. That example function would print "< command name > is not a recognized command.". The "print" function just adds text to the output history buffer. This function is used to remove an item from the list by providing its name, preety straightfoward. These three functions are used to control keyboard input: The first one is used to send the characters to the console ,i.e. passkey(�c'); would write a "c" in the console. The second function is used to delete the last character from the console (when backspace is pressed). And the last one is used to execute the command line. This is our virtual rendering interface, it will be used in the derived class to present the content of the console to the screen. By making it pure virtual we ensure that this class is not instanciable so it can not be used alone. The parseCommandLine function will be explained later, it has a whole section for its own. These two lists (more info about std::list click here) are the responsible for holding the command line buffer, that is composed of several strings (more info about std::string click here) and the item list that has already been discussed before. I made these variables private because the derived class will have no need to access them directly. Here we have another list with the history of all the console output, when initializing the console we choose how many lines to store. If the buffer passed the maximum number of lines then the oldest line is erased and the new one is added. Exactly the same happens with the command line buffer. Now we have to make a function that looks in the list of items and executes it if it's a command or otherwise changes the variable. It all starts in the "passIntro" function. Nice function, isnt it? It is very easy to understand though, but I will explain the most difficult parts anyway. The first part of the function adds the commandline to the output text buffer, this works as a command echo, you can enable it or disable it. It's just an extra feature, if you want erase everything related with it and the console will just continue to work perfectly. The second part adds the commandline to the command history buffer, we've talked about this before. The third part tokenizes (divides) the commandline into a vector of strings where the first element (element zero) is the actual name of the command and all the other elements are arguments. The last and more complex part starts by looking one by one all the commands and variables in the list and then compares the name provided in the command line with the name stored in the item information, if we have a match then we go on, if we don't we execute the default command. If we find that the commandline first argument is a variable and that we have not provided any argument (we just wrote the variable name) then its a query command and we simply format the string and print out the variable content. If we have provided one argument then we convert the argument string to the item type format and we set it to memory (remember arguments size is 2 because the first element is the command or variable name itself!). We may also come across the execution of a command which its a lot easier, in this case we just execute the associated function passing the vector with the arguments to it. Note that we dont pass a copy of he vector, we pass it by reference!, be sure to check this out because its a very useful technique. You can save time, memory and much more! (optional site 2). This is just an example of how to switch the key input and send it to the console. One of the strong points of a console is that it lets the user execute commands, by adding them to the list you can easily make the console pass a list of arguments to the hook function. After adding the command when the user types "/print_args 1 2 hello" the console would output "1, 2, hello". This is just a simple example of how to acces the arguments vector (more info here). Well well, what have we learned? Now you can design, code and use an extensible and complex console system that uses STL containers for efficiency and stability. 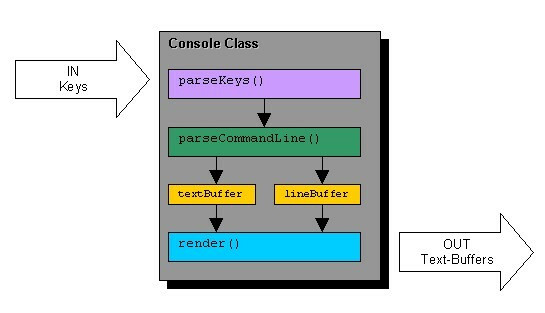 In this part of the article we created the base class for the console system and in further articles we will discuss how to create a *REAL* text-console system and compile it. We'll also probably create the typical "Quake" style console that we all love... and want. The uses of this systems are infinite, the only limit is your imagination (*wink*). You can check the attached code here to help you understand the system we tried to design. NEVER copy-paste this code or any code because it will be no good for you, the best you can do is to understand it, understand how and why it works and rewrite it or copy the example and adjust it to your needs.